I am finishing up the Star Trek: The Next Generation episode "The Game," wherein the crew of the Enterprise get addicted to a virtual reality headset game involving putting a disk in a cone. It is incredibly dated CGI. This game doesn't appear to be more thrilling than the games that existed when this episode was aired (1991), and TNG takes place in the distant future. Is no effort put into video game design and video games in general? Does anyone in the Star Trek universe mention video games or play them? 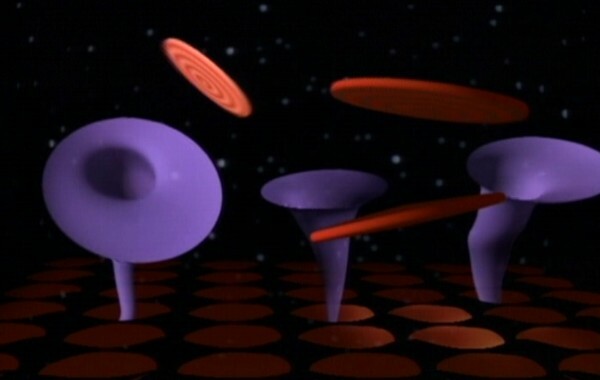 Is there any reason other than the game's addictiveness that they are they so enthralled by putting disks in cones? That particular game is more enthralling because it gets you high, and has some mind-control elements. The plot for that episode involves Riker on vacation receiving the game from a lady friend of his. He gets hooked, takes it back to the Enterprise and shares with with all of the crew. Wesley and his lady friend don't play it, see everyone else becoming mind-controlled podpeople, and save the Enterprise by getting everyone deprogrammed. At the end of the episode, Riker's lady friend shows up, expecting the crew of the Enterprise to be under her control. To answer the rest of your question, yes video games still exist. There are games in the holodeck/holosuite. Beyond just using the holodeck/holosuite as a simulated field for games to be played (i.e. making a baseball field, or the 3D racquetball game Miles and Bashir play), the Vic Fontaine arc where his casino is taken over by a rival is essentially a sort of Sim-casino game. In addition, I recall a DS9 episode where Rom got hooked on a handheld game that Nog owned, but can't recall more details on that. There's also dialogue at the start of the DS9 episode Blood Oath where Quark mentions a Klingon battle being played out in a holosuite. The key thing is that the person using the holosuite keeps losing the battle. The ability to lose is a commonplace component of video games, as it is a way to set the player back until they successfully accomplish some goal. Quark's description that you can lose the battle shows that the holoprogram is interactive in a way that directly mimics modern video games, it's not just an immersive non-interactive movie. As Keen perhaps alluded to, The Game was more an episode about drug addiction than about video games. DS9, TNG, and even Voyager have many holodeck episodes which are much more likely to be the future equivalent of video games than what we think of today. There are a few episodes, however, that elude to modern video games without the holodeck. For instance, Move Along Home in DS9 was about a virtual reality game that some of the players fear could kill them. A matrix precursor of sorts. It's like a more advanced version of Mario Party. Star Trek: TOS and The Motion Picture both indicate a number of games (some table-top, and some videogames) that are played in the 23rd century. Star Trek: TNG and its successor series' have holo-decks, so I guess by this point CoD-like videogames would have been supplanted as you can really get in on the action in a holo-deck (as long as the safeties are properly engaged). There are still table-top games (like the 3d chess). We also see a 2-player strategy videogame in TNG (s2e23 "Peak Performance"). The thing is - the audience probably wouldn't be interested in watching characters play videogames, so they wouldn't have been featured all that much. The novelization of The Wrath of Khan mentioned a game called "Boojum Hunt". It was a game David Marcus worked on in his spare time and it was a real memory hog. When Dr. Carol Marcus (in the movie) mentions that that there isn't any more memory available, in the book she later finds out that her son was taking up a huge chunk of it for "Boojum Hunt". Later, when Khan raids the Regula One station, he starts combing through data on that computer and thinks he's found "Genesis". He discovers it's not and scream "A GAME?!?!?!" and goes on a rampage killing members of the scientific team. In "Star Trek III: The Search For Spock", there is an arcade game involving biplanes in a dogfight. Quark has his casino games. In "Star Trek V: The Final Frontier", in the City of Paradise, their version of a saloon/bar/tavern, featured "Pool" with actual water! Charlie Evans encountered crew members that played board games/table top games. In the 2009 movie, the bar in Riverside featured games in the background. As for video games in Classic Trek, you wouldn't see any until after they were invented in Real Life and thus the writers became aware of the concept. The later writers went beyond them with the holographic simulations. In Archer's time, the crew still gathered to watch movies like they do in "M*A*S*H", but by Picard's time, people interact in stories instead, usually derived from books rather than movies. For example, the VOYAGER Crew did "Beowulf", but as you know, it wasn't the same one that Angelina Jolie was in. I'll leave it at that. In Enterprise episode "Dead Stop", isn't there a game with holographic biplanes dogfighting aboard the automated repair station? I may remember it incorrectly, and if it's there it wasn't Federation technology (obviously, as it's pre-Federation). But still, that the station generated it after scanning the crew and determining a pleasurable waiting area for them might indicate that at least some people aboard NX-01 would enjoy such arcade-style games. Not the answer you're looking for? Browse other questions tagged star-trek star-trek-tng video-games or ask your own question. Is there filtering on Star Trek audio/video communication channels? Are the Borg considered 'living' within the Star Trek universe? Are there any large private companies in the Star Trek universe? Are the Ninja Gaiden games in the same universe?